Our flight suits are light weight, thin material and can easily be worn over clothes or by itself. They cover your entire body and are super easy to take on and off. Cuffs are adjustable with hook and loop fasteners. Front of flightsuit has full 2 way zipper up to crotch area. 2 Vent holes under each armpit. Left chest has hook and loop area (approx 4″ long x 2″ wide) to attach patches to the flightsuit. Hook and loop section has a cover which can be removed. Slash pockets on both chest sides (approx 10″ long x 8″ wide) with zipper closure. Middle chest area has 2 hook and loop pulls (one on each side) to adjust size in the chest/belly area and give a secure comfortable fit. Side of the flightsuit has 2 zippers without pockets so you can easily access any gear or adjust clothing underneath without removing the suit. Air Force Flight Suits, US Military Type Coveralls, Uniform Overalls / Jumpsuits for Work with Official Army Universe Pin – Our flight suits are light weight, thin material and can easily be worn over clothes or on its own. They cover your whole body and are super easy to take on and off. These coveralls are easily modified and make great costumes for cosplay, comicpalooza, alien movies, maverick from top gun, kaylee, firefly and more! They also are great For Work, Mechanics, Uniforms, Paintball, Airsoft, Hunting, Fishing, Costumes, Props and more. 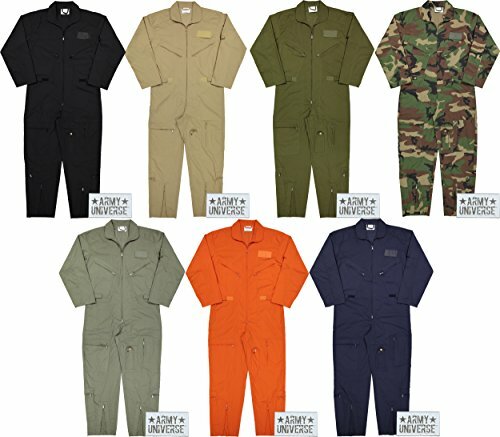 Whether you are a pilot or groundscrew, having a look to dress up or use it for work, these coveralls will do the job. They don’t seem to be authentic and not made in the united states. It is a good suggestion to order one size larger than you typically wear if you plan on wearing this over full array of clothing. These uniform jumpsuits are cut for men but may also be worn by women as well. A flight suit is a full body garment, worn at the same time as flying aircraft such as military airplanes, gliders and helicopters. These suits are usually made to keep the wearer warm, in addition to being practical (numerous pockets), and durable. Its appearance is on a regular basis very similar to a jumpsuit or coveralls. A military flight suit may additionally show rank insignia. Chest Sizes: Small: 33 – 37″. Medium: 37 – 40″. Large: 40 – 43″. X-Large: 43 – 46″. 2XL: 46 – 49″. 3XL: 49 – 52″. 4XL: 52 – 55″. 5XL: 55 – 58″. 6XL: 58 – 60″. Our flight suits are light weight, thin material and can easily be worn over clothes or on its own. They cover your whole body and are super easy to take on and off. Cuffs are adjustable with hook and loop fasteners. Front of flightsuit has full 2 way zipper up to crotch area. 2 Vent holes under each and every armpit. Left chest has hook and loop area (approx 4″ long x 2″ wide) to attach patches to the flightsuit. Hook and loop section has a cover which may also be got rid of. Slash pockets on both chest sides (approx 10″ long x 8″ wide) with zipper closure. Middle chest area has 2 hook and loop pulls (one on each and every side) to adjust size in the chest/belly area and give a safe comfortable fit. Side of the flightsuit has 2 zippers without pockets so you’ll easily get entry to any gear or adjust clothing underneath without eliminating the suit. Right Knee has a zipper pocket (approx 9″ long x 7″ wide). Left knee has a side zipper pocket (approx 9″ long x 5.25″ wide) and a snap button section for flashlights or pens. Both lower leg (ankle area) has a zipper pocket (approx 9.5″ long x 7.75″ wide) on both sides. Both legs are pleated and have zippers that expand the suit an extra 2.5″ approx so you’ll easily take the suit on and off without eliminating your shoes. These flight suits are top quality and offer an authentic reproduction look. Imported. These suits are cut for men, but may also be worn by women as well. Please consult our size chart only to select the proper size and to make sure you are going to have a full range of motion and comfortablity at the same time as wearing.